It’s rare that a piece of advertising transcends its primary purpose and evolves into a much needed piece of social commentary, depicting and discussing the troubled times in which we live, and in so doing, provides essential nourishment for the mind. 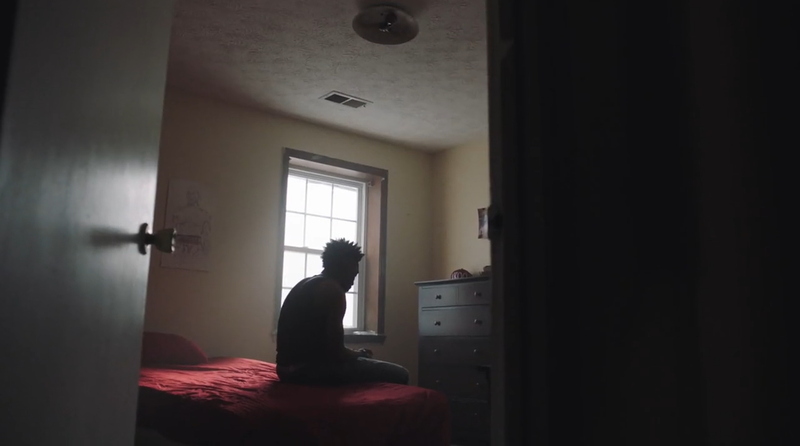 Commissioned by clothing label AKOO and directed by John Merizalde (no stranger to DN’s pages), 11x HUMAN holds a soul searching mirror up to the emotionally charged issues of racism, crime within the black community and the hot button topic of police brutality, leaving the viewer thinking long and hard well after the credits roll. DN asked Merizalde to guide us through the production process which resulted in one of the most powerful and timely pieces of filmmaking to hit the web this year. Develop a treatment for a short film that is rooted in fashion and is visually stimulating and thought provoking. The back drop and common thread throughout the film should be that of civil unrest and explore the current severity of modern racism, black on black crime within our own communities and police brutality. We want the film to be informative, high energy, gritty but not preachy. A brand rooted in hip hop, it was impossible for them to ignore the current state of America. 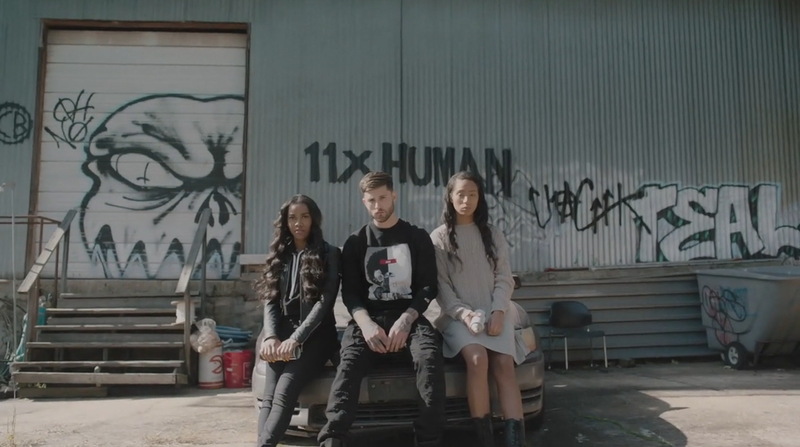 Their clothing features various racially and politically charged messages, the clearest example being the name of their line (and the film), 11x HUMAN. Use of the number 11 throughout the collection is a reference to the number of times Eric Garner said “I Can’t Breathe” while being choked by NYPD. I immediately connected with the vision they proposed, and it was exciting to have the opportunity to create a piece of branded content with some weight and humanity. It’s not something that comes across very often. 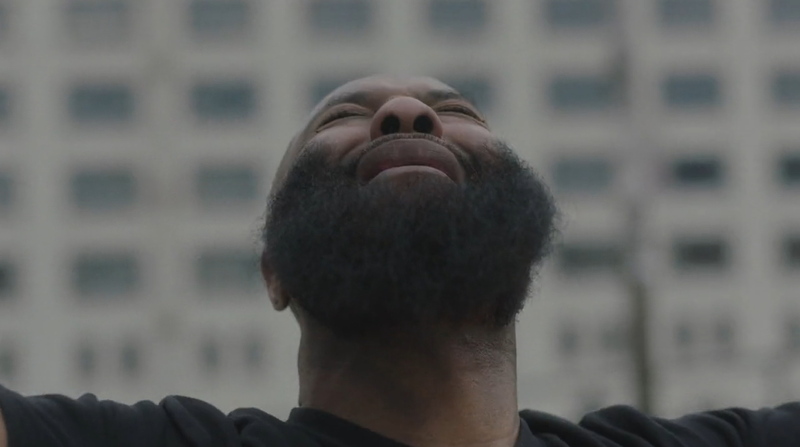 Having Killer Mike on board from the beginning only solidified what we were doing. I couldn’t imagine a more appropriate narrator for this piece. It was exciting to have the opportunity to create a piece of branded content with some weight and humanity. There was a lot of dialogue with the agency in the beginning, trying to get to the root of our message and idea. Initially, my approach was extremely linear – I wrote out a 10-page script with sort of a traditional narrative structure. After revising several times though, I just felt that it was too on-the-nose. I came to the conclusion that the best way for us to tackle this large idea was with a large canvas. I wrote out many different scenes and vignettes encompassing a range of humanity – the end result being a digital quilt, patching everything together. We struggled to make sure we weren’t leaning too much in any particular direction, or trying to give any set point of view. In an art-house cinematic way, we attempt to shine a light on the subject of ”the police’’ ”the brutality’’ ‘’ourselves’’ ‘’the culture’’ and ”the hood’’ without trying to give an answer. We settled on the concept, and I flew out to Atlanta the following day. Atlanta was chosen as our backdrop for many reasons, some being practical and some thematic. Not to mention it’s the hometown of T.I., Killer Mike, and myself. Our production team was stellar. Tre Native, led by David Kwon Kim and Brandon Smith, were somehow able to wrangle together all our cast and locations in about a week. Luckily, there were an enormous amount of people who were willing to contribute time and resources to this project. Hopefully we managed to fit most of them in the credits! There was sort of a scattershot approach to production, shooting on Amira, Dragon, Super8, and hi8 over a period of 5-6 days. A relatively low-budget affair, we pretty much had to run-n-gun it. My DP, Kristian Zuñiga, handled it like a champ, and was willing to get down and dirty for any shot, operating, and sometimes even pulling his own focus. Before production, we put together a lookbook and set aside certain visual guidelines for the piece. There was a very rough shot list, just to make sure we had coverage, but once on set it was very much an improvisational affair. This kind of piece needed spontaneity, and I trusted Kristian’s instincts when shooting on the fly. There were tons of scenes we got all over the city, several of which didn’t even make the cut. The mixed media approach was something I wanted from the onset. Although I love the Alexa, sometimes there lies more emotional authenticity in lower formats. Subconsciously we associate certain visual formats with “reality”, and I think that can be selectively used by filmmakers to add something to their films. It can also be a great tool in incorporating some stylistic flair. My original intention with the mixed media was to give scope to the world and fight some of the inherent contrived issues with a branded piece. Breaking the format barrier gives some grittiness and reality to the images, which hopefully amplify the real message embedded within. From the onset, I wanted to have as many formats available on set at once. Almost every scene had 3 different cameras rolling simultaneously. Although I’d love to claim it was meticulously pre-selected, we really just shot as much as possible. That being said, there were distinct visual approaches taken with each format – high definition used more to establish a scene, and lower definition used to explore emotion and nostalgia. A lot of directors edit their own work, but I’ve found that collaboration often leads to better and fresher ideas. We flew out an editor from LA as soon as we wrapped to begin working on the cut. Andrew Litten, who’s also a talented director in his own right, brought a very unique perspective and energy to the edit. Early on in pre-production, we had assumed and communicated to the client that stock footage would be necessary to fill out the piece. Once we reached post though, we had about 6 hours of original footage. No stock needed. Andrew and I both come from the music video world, so the easiest way for us to lay out a foundation was to use a music-driven rhythm. The style part was easy. Thematically, it was a long dialogue spanning the length of production. How do we hit on all these themes without being too overt or heavy handed? How do we cover these sensitive issues without pointing the blame at a particular group or individual? It was an endless series of questioning, and the first few cuts involved a lot of experimentation. The edit was nonstop. With a non-linear piece like this, the possibilities are endless. If there wasn’t a hard deadline, I have no doubts we’d still be cutting to this day. I think what really guided the edit is that we were intent on making an optimistic statement. Something that could glimmer some hope. Ultimately we relied on our emotional compass to shape the edit and luckily Akoo had total faith in us. We had an original score drawn up in two days from Patrick Canaday, and also had a nice contribution in credit music from NEVR. My longtime collaborator David Torcivia rounded out the piece with final color. One of the most exciting stages of the process was working with Killer Mike. We briefed Mike from the beginning on our concept, and sent over stills from the shoot as we went. Much like the visuals, the voiceover was a collaborative improvisation. Unfortunately, we were still deep in the edit when it came time to record Mike’s VO. When we arrived at the session, all we had was screen grabs to share. Despite that, they still had an impact, and he was able to see the vision we had. I never wanted there to be a strict script to adhere to. Killer Mike is such an eloquent orator that all we had to do was start the fire, and he would take it over. I wrote a long breakdown for Mike to read before we began recording – basically detailing all of my thoughts, emotions, and ideas regarding our film and the subject matter. I posed questions and talking points for him to bounce off of as we recorded, and the intention was always to have an intimate narration style – as if he is talking to you directly. Mike is an incredible performer and speaker, and he always speaks from the heart. It didn’t take long for him to get going and drop some truth. Once in the recording studio, he nailed it. All the energy, passion, and message you hear is authentic. His contribution is the lynchpin of the whole film. The topics covered are very real and current, and the last thing I wanted to do was exploit them. This was a challenging piece for many obvious reasons. There were many long debates on where to go with the piece and what to say with it. The topics covered are very real and current, and the last thing I wanted to do was exploit them. The battle between art and commerce is something many filmmakers face, and it’s hard to toe the line when you have corporate funding. Luckily AKOO believed in the idea and was willing to let the product take a backseat to the message – something many brands wouldn’t be open to doing. It’s a difficult balance, but hopefully the end result is something tasteful and authentic. Regardless of sponsorship, the message is real, and that is what we want to stick with people in the end.